SterJo Task Manager software is used to manage all the running processes, services, total processes that use Internet, and registry programs. It allows to perform all the necessary actions that help to manage processes, programs, and registry items. You can kill or terminate any running process or can set its priority high, low, medium, etc. This helps to manage CPU usage. 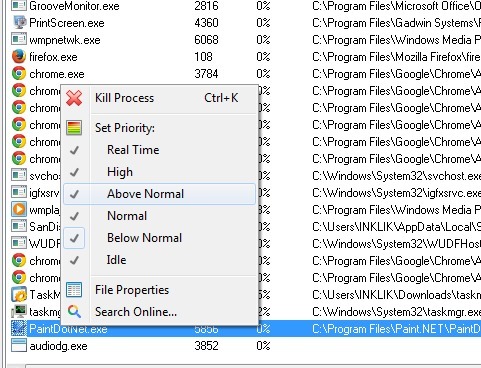 Using this task manager software, you can also speed up Windows startup by excluding or removing unwanted programs from registry. 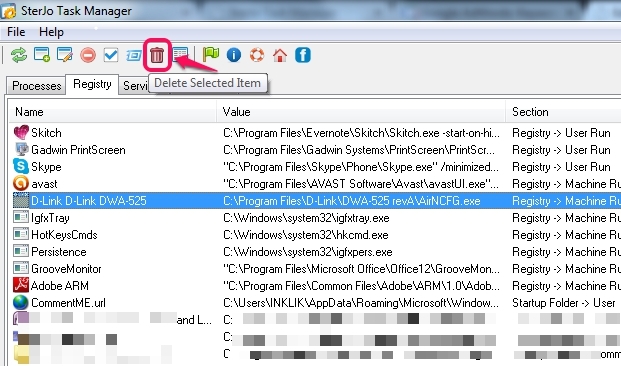 It is a good alternative to Windows default task manager, as it performs many tasks. You can view each processes CPU usage separately, can manage startup type (auto, manual, or disable) of services, and can close any unnecessary established connections. Processes tab: This tab provides all the system processes, their priority, CPU usage, path, description, and digital signature (whether a process is trusted or not). You have the option to set the priority for any process (excluding some processes, like antivirus) either real-time, high, normal, medium, below normal etc. Apart from this, you can even terminate a process immediately. Just right-click on any selected process and take actions. Registry tab: This tab will allow to view all the registry programs that are running on PC as well as those programs that starts with Windows startup. You can disable any program or can simply delete a particular program from registry. Thus, it helps to manage Windows boot speed. So without using any startup manager software separately, you can improve Windows boot time. It can be done either by right-clicking on a selected item or by using the shortcut buttons available at top part on its interface. Services tab: All the services available on PC (stopped or running) can be viewed using the service tab. You can start or stop any service and can set the running mode of any service to automatic, manual, or completely disabled. Connections tab: Total number of processes that requires Internet, their TCP and UDP protocols, established connections, CPU usage taken by connections can be seen in this tab. You can also close any connection which is not necessary for you. A quite useful task manager software that can manage all the processes, services, and registry programs. 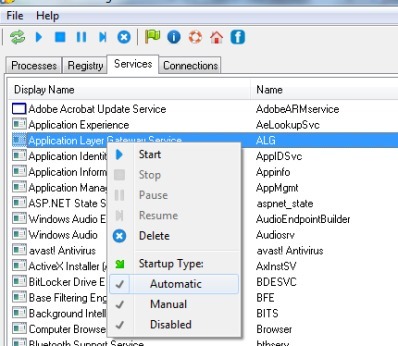 It lets you set priority for processes, remove or add a new program to registry startup list, and start/stop any service. Provides connections tab that shows all the processes that requires Internet connection. This feature you won’t find in default task manager. It is portable so installation is not needed. 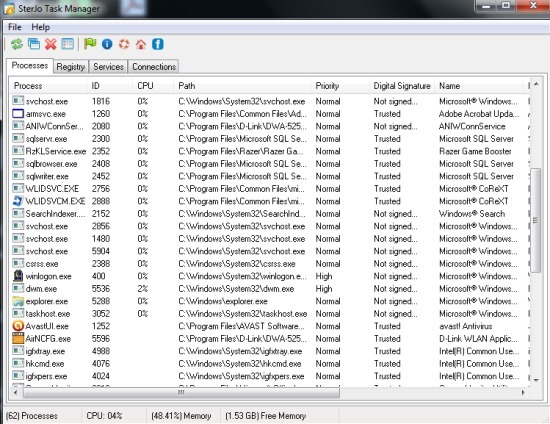 You can also download the installer version of SterJo Task Manager. Check out these similar task manager programs for Windows. SterJo Task Manager is beneficial for users as it allows to get full control over all the processes. And its ability to manage startup list and processes that uses Internet connection makes it more useful.